Nanjing Science and Technology Museum is located in Ningnan New Area, Yuhuatai District, covering a floor space of 300,000 square meters. The main building covers a construction area of 30,000 square meters with a total investment of RMB 350 million Yuan. It includes the main building, special cinemas and a beautiful park. So we can say it’s a modern museum which integrates science and technology with humanities, arts and tourism. At present, it has become very popular with kids in and around Nanjing City as a place for popular science education. 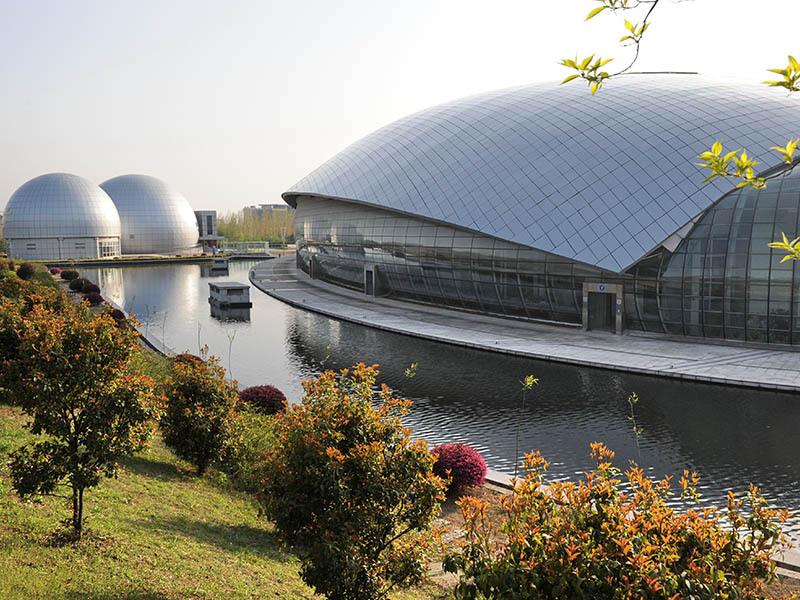 As a fascinating place for science exploration, Nanjing Science and Technology Museum has a special appearance and extraordinary inner structure. Full-steel structure can better guarantee the safety of the main building. The appearance of the main building has been designed like a cabin, which is cooperating with our theme-science & technology. Such design is inspired by a mysterious aircraft in the fiction Twenty Thousand Leagues under the Sea written by Jules Verne, a famous French writer. The building is surrounded by a 400-meter long man-made lake which is also called Mirror Lake. Such design makes the whole main building like a huge oval submarine landing by the side of beautiful Huashen Lake. The whole design means tourists coming here can take this aircraft to travel in the knowledge ocean. The interior of the main building is composed of three parts, permanent exhibition hall, non-permanent exhibition hall and an international conference center. It is divided into four floors. The 3F is the newly built Nanjing Animation Experience Center. The 2F is ‘Phenomenon on Earth, Wisdom Master’. The 1F is ‘Creative World, Children’s S&T Center’. The underground Floor is Nanjing Public Safety Education Center. Its layout is reasonable and orderly. It always pursuits the best combination of science and technology exhibits, cultural knowledge and art forms. Tourists coming here can enjoy the unique experience that is brought by science.